Truth is not something that is generally valued in our society. It is often and easily sacrificed or crimped in place of loyalties, biases, or convenience. But truth does not have to be mutually exclusive with any of those things. Sometimes, you can cling to loyalties while still acknowledging the truth. What has always separated the UFC from the WWE is that the UFC has always claimed to be “as real as it gets;” while in recent decades, the WWE has not shied away from the fact that it is strictly entertainment. I’ve always been a fan of both, and I’ve been a Brock Lesnar fan since 2002. That’s 16 years. Ever since I saw the man do a belly-to-belly suplex to the near-500-pound Big Show at Survivor Series 2002 among other breathtaking suplexes capped off with a Garden-quaking F-5, I have never looked at him the same way. From that point forward, Brock Lesnar was the wrestler I admired most. I have gone on to cheer for Lesnar uninterruptedly since then, especially in the UFC, through all the highs and lows. And here I stand present day, still a big fan of Brock Lesnar. The purpose of the above introduction is not to lead into a personal narrative of myself as a Brock Lesnar fan or some kind of biography of Lesnar’s career. I say this to demonstrate that sometimes you don’t have to be a hater to call out nonsense. Sometimes, you just have to be a realist and to have an attachment to truth more than personal bias. 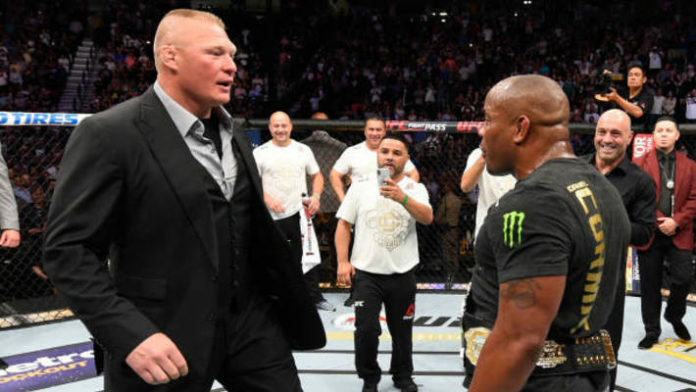 And the reality and the truth of the matter is: Brock Lesnar has absolutely no business getting a heavyweight title shot against Daniel Cormier. But more importantly than that, from a matchmaking perspective, this is the most dangerous precedent in the history of the sport. I was very vocal about Georges St. Pierre receiving a title shot against Michael Bisping at UFC 217 while Yoel Romero was on such a tear and while Bisping was still yet to defend his title against a top contender. But looking back, compared to this situation, that was a much more defendable scenario. Because even without the “bigger draw” argument, GSP was on a 12-fight win streak (albeit in another division) and is in the conversation for being the greatest fighter of all time. While still unfair to Yoel Romero and the middleweight division that was still waiting on Michael Bisping, there was at least a semblance of logic to that fight being made for the middleweight title. And even when Brock Lesnar himself earned his first title shot with a 2-1 record, I would argue there was no clear or dominating #1 contender who was getting shafted in his place, and at least he was coming off of a win. That’s not to say that he deserved a title shot, but the decision to grant him that shot was not nearly as unfair as Brock Lesnar receiving a world title shot in 2019 over Curtis Blaydes, a man who is coming off a win against a top-3 contender, is on a five-fight win streak, and whose only loss came by way of a technicality. Nor is it as unfair as him receiving a shot over Stipe Miocic, a fighting, record-breaking champion who has conducted himself honorably inside and outside of the cage. Never to this degree has a fight been made where the only possible justification was money at the expense of the credibility and meritocracy of the sport. At first, I was stumped as to why they had to give Brock Lesnar a title shot in order to attempt to draw fans. After all, if Brock Lesnar is the draw, then as long as he is fighting an opponent who presents a challenge, the numbers should be in the same range, right? As it turns out, the belt being on the line actually does make a big difference. The only non-title PPV Lesnar appeared in that did a million buys was UFC 200, which was a landmark event with a stacked card that already had some carryover buzz, commitments, and buys when the main event was expected to be Jon Jones vs. Daniel Cormier. But aside from this anomaly, Lesnar’s fights with Heath Herring, his first fight with Frank Mir, and his fight with Alistair Overeem all did under a million buys, while every one of Lesnar’s title fights pulled in over a mil. So there is no mistaking that the evidence suggests that the belt makes a big difference and that DC vs. Lesnar should be expected to do a million buys. But at what cost? With the UFC signing a five-year deal with ESPN, the sport has never had such a platform and opportunity to, well, be a sport. And there is absolutely no justification from a sports perspective for Brock Lesnar, a man who is 0-2-1 in his last three fights and coming off a USADA violation to be receiving a title shot. Zero. Not even the most ardent and intellectual debater or contrarian walking planet earth can craft a legitimate argument of how Brock Lesnar should receive this title shot over Curtis Blaydes or Stipe Miocic based on merit. So if you’re ESPN, how do you present such a product to your fan base as a sport? Sure, you could say, this is an exception to the rule and that it’s a one-off, but if Brock Lesnar can receive a title shot without any possible argument for how he deserves one, then this opens the gates more than ever for other less deserving fighters to receive a title shot. This may sound like nothing new, but it is. If a fighter with zero legitimate argument for a title shot can receive one, that sets a precedent for others with zero legitimate argument to receive one based on look, twitter followers, or any other arbitrary reason that deems them more popular and thus more of a draw. If you are someone who is often on social media siding with the fighter over the promotion about things like fighter pay, getting compensated for camp when an opponent is unable to make it to a fight, contract negotiations, or any benefit that you believe fighters should receive that they do not get enough of, and yet you fall silent when someone like Curtis Blaydes or even Stipe Miocic are being deprived of the pay they deserve for a title fight they deserve, I’m going to need you to do some inventory on your consistency. There is no two ways about it: Curtis Blaydes deserves a title shot, and Stipe Miocic deserves a rematch. Both of those scenarios of what these men deserve is attached to fighter pay and fairness. So if we are adopting the “it’s a business” mindset, then it would follow that this same mindset applies when fighters complain about their insufficient pay, the Reebok deal, or any other grievances they have. But the “it’s a business” narrative seems to only apply to matchmaking as if this is a separate issue from fighter pay and fairness to the athletes, but it is not. So if you are for fairness to the fighters financially, you should also advocate fairness to the fighters in matchmaking, as the two topics are directly related. And if you care at all about the UFC being considered a legitimate sport, this match should concern you. Because of all the matches ever made in UFC history, none is more “entertainment-based” than sports-based than this one. Of all the talk about the post-fight antics at UFC 226 between Lesnar and Cormier, the biggest antic of all is the fight being made in the first place. That is the most WWE part of all of this. As a fan of the WWE myself, I can vouch for that. As someone who has always cheered for Brock Lesnar, I’ll be cheering for Brock Lesnar if this match actually happens, not because a win of his would be good for the sport but because I have always cheered for him and I won’t stop now. Make no mistake, if it were up to me, this fight would not be made, and I’d be able to cheer for Brock Lesnar against someone like Curtis Blaydes or Stipe Miocic, while the other receives the title shot on the same card. Personally, I think Blaydes vs. Lesnar and Cormier vs. Miocic 2 makes the most sense, with the two winners facing off at a later date. I believe there is a chance such an event could do a million buys even though Lesnar isn’t fighting for a title, while still showing respect for the sport. But the reality is, those aren’t the fights that are taking place. As bad for the sport as this fight is in my opinion, sure, I am exited to see how the fight looks and will be cheering for the undeserving fighter when the day comes, and I’ll do so out of loyalty and out of habit. So maybe I’m as contradictive as the fans who cry for better pay and fairness for fighters but then fall silent when people are not given title shots they clearly deserve in place of names that are considered “bigger draws.” Maybe that’s me being a hypocrite. Or maybe it’s just being the one thing that has always separated the UFC from the WWE in the first place and something the MMA community and society as a whole needs to be more often when concurrently being hypocritical, inconsistent, or biased: real. And the ultimate reality in this situation is that no matter what side of the fence you fall on in the entertainment vs. sport debate, and no matter what degree of an MMA fan you consider yourself to be: if and when this fight happens, you will be watching. And the knowledge of that fact and the booking of this fight proves that despite what much of the MMA community might mock about the WWE’s “entertainment fighting,” the UFC also considers itself to be more entertainment than sport. And this fight proves that fact is as real as it gets.